The threats posed by Climate Change, the continuously increasing pressure on agri-soils in order to fulfil food demand and the request in terms of environmental sustainability and products quality, requires advanced tools and methodologies for efficiently manage water resources and optimize agricultural and irrigations practices. 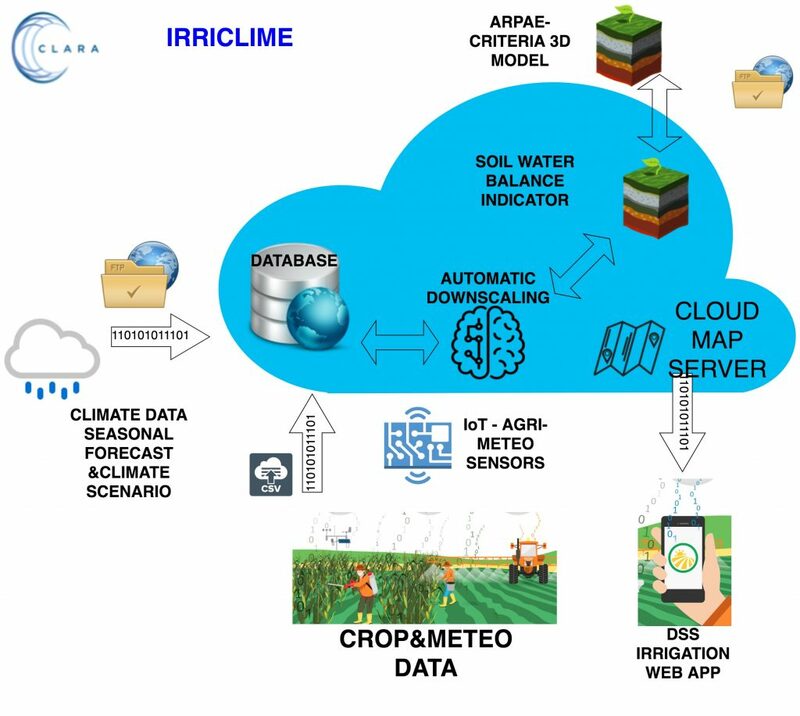 IRRICLIME is an open-source web mapping application to spatially and temporally predict, on a monthly, decadal or daily basis, core water budget variables and other agri-variables (hydro-climatic balance BIC, Soil Water Content SWC, Evapotranspiration ET etc.). Aimed at promoting a Climate Smart Agriculture and Climate-proof Irrigation, this service will provide forecasts from seasonal long term to climate change conditions. Users (Irrigation Boards, farmers) will be guided in designing climate-proof irrigation system and identifying the best mitigations and adaptation options for facing seasonal and climate challenges in agriculture. 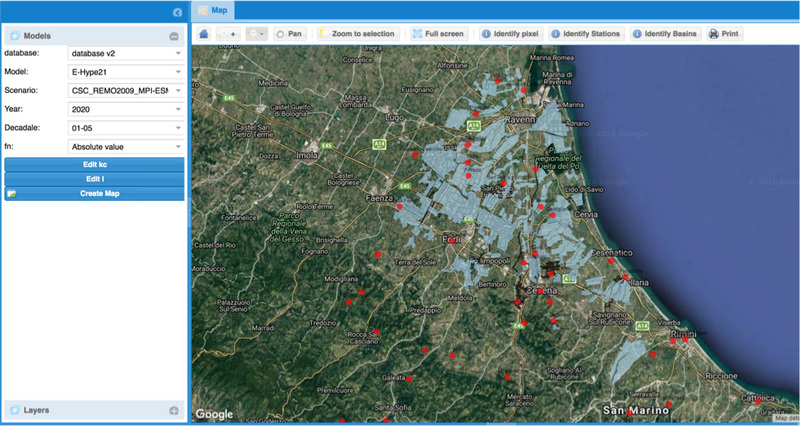 The service, developed through effective codesign process with end users, exploits Copernicus C3S ensemble climate change scenario and seasonal forecast data, together with local agri-meto data, irrigation and crop specific informations. The tool is actually developed under EU H2020 funded project called CLARA (EU FP7 project No 730482) coordinated by CMCC (http://www.clara-project.eu/ ) with the support of Consorzio di Bonifica della Romagna. The service tackles the needs of the following users: – Water resources and infrastructures managers: support the efficient administration of water distributed to farmers, by helping operators understanding the adequacy of their current and planned infrastructures. In the short-run, operators may plan an increasing number of basins, while also informing the farmers about potential risks they are facing. This will eventually affect their farming practices. Farmers: the service can be used to understand how damaging can their farming practices be in the short, medium and long run. Given the information they receive, they may change the cultivated crops shifting towards less water-intensive ones. Insurance companies (potential): these are private actors who may be interested in IRRICLIME to change the value assigned to crop yields. These users are only potential ones: not really tackled by the project itself but coming at later stages. The IRRICLIME will be made available as a Web-mapping service where a dedicate Web-Wizard will guide the users in performing long-term and seasonal climate analysis of irrigation needs and climatic risk, with the possibility to assess the economic damages and supporting the selection of the best mitigation and adaptation options. The WEb-GUI (Graphical User Interface) will assists the end-user in performing a step-by-step climate analysis and no need of specific skill in hydrological modeling and data analysis will be required. The user should only provide the following input data: culture type, irrigation capacity and historical on-site meteo data. As reported in the IRRICLIME framework, two different soil/crop water balance indicator will be implemented in the service. The first one is a simplified indicator consisting in soil hydro-climatic balance (BIC) and evaluated as a net balance between rainfall and PET every 10 days. In case are available the information related to the Irrigation amount and the crop specific evapotranspiration coefficient (kc) the hydro-climatic balance indicator is adapted and computed taking into consideration the two parameters. Find out the IRRICLIME demo now!